Clare Briggs. 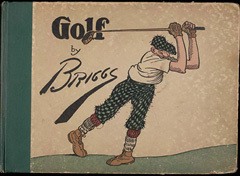 Golf: the book of a thousand chuckles: the famous golf cartoons, c 1916" (Smithsonian Institution Libraries). "Galaxy of Knowledge," is Smithsonian Institution Libraries' portal to its collections and to a wide array of exceptional Internet resources. The site brings together the web-accessible content created by Smithsonian Libraries into a carefully structured format that allows users to fully explore and use the Smithsonian Institution Libraries online offerings. The Galaxy of Knowledge creates a virtual bookshelf of digital editions  cover-to-cover, high-resolution digital replications of selected Smithsonian Libraries' holdings, and brings together additional online projects such as online exhibitions, and research materials such as bibliographies and research guides. The wide variety of materials encourages the visitor to use the "Galaxy" for a variety of purposes, from education to entertainment. "As a steward of a distinguished national collection, the Smithsonian Libraries continually seeks to enhance its outreach," Libraries' Director, Nancy E. Gwinn notes. "The 'Galaxy' is part of this ongoing commitment to making our books and manuscripts accessible to the widest audience possible." 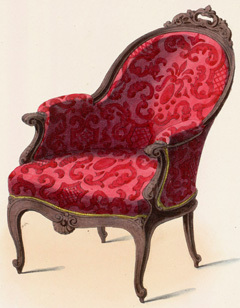 Chair from Le Garde-meuble, ancien et moderne (Smithsonian Institution Libraries). The "Art and Design" section of the Galaxy of Knowledge (http://www.sil.si.edu/galaxy/art.cfm) brings together content from the art and design collections of the Smithsonian Libraries. From the Cooper-Hewitt, National Design Museum Library, selections include Le Garde-meuble, ancien et moderne (Furniture repository, ancient and modern). Le Garde ... was a bimonthly periodical published in Paris which exerted an enormous influence on design throughout the world for nearly a century by promoting French styles in furniture, fabrics, and interior decoration. This site includes over 700 images from this influential publication. Other offerings from the Cooper-Hewitt Library collection include two small exhibitions, Vibrant Visions: Pochoir Prints in the Cooper-Hewitt, National Design Museum Library and Czech Book Covers of the 1920's and 1930's in the Cooper-Hewitt, National Design Museum Library. Other "digital edition" highlights include William Mullingar Higgins' The House Painter, or, Decorator's Companion (1841). This work includes samples and recipes for creating a variety of faux finishes to imitate wood grains and marbling. Drawing from Life is a collection of caricatures and cartoons from the American Art/Portrait Gallery Library collections that includes works from William Hogarth to Charles Dana Gibson. The art library collections of Smithsonian Libraries house important collections of print ephemera on art and artists. Art & Artist Files in the Smithsonian Libraries' Collections is an ongoing project to provide artist name access to these collections located in the Smithsonian American Art/Portrait Gallery Library, the Cooper-Hewitt, National Design Museum Library, Freer Gallery of Art and Arthur M. Sackler Gallery Library, Hirshhorn Museum and Sculpture Garden Library, and the Warren M. Robbins Library, National Museum of African Art. Over 53,400 artists are now represented in this database with new artists added daily. Artist files from other Smithsonian Libraries' collections, including the National Museum of the American Indian Library, will be added and over 100,000 names will eventually be represented. 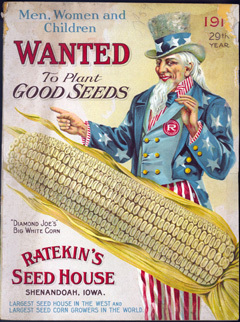 Uncle Sam with ear of corn from Ratekin's Seed House (Smithsonian Institution Libraries). Launched in December 2005, the Smithsonian Libraries' Galaxy of Images (http://www.sil.si.edu/imagegalaxy/) brings together nearly 8,000 images from the Libraries' collections into a single searchable and browseable site. Visitors can browse images in any of 100 plus "collections", ranging from "advertisements" to "zoos" or search for images on keywords of their choosing. Images from the 15th through early 20th century are available from the Art & Design portion of the Galaxy of Knowledge as well as the rich holdings in scientific illustration, American technology and industry, and related fields. Maintained by Libraries' special collections cataloger S. Diane Shaw since 1998, Library and Archival Exhibitions on the Web provides links to over 4,200 online exhibitions related to books, libraries and archives from around the world. Situated at the center of the world's largest museum complex, the Smithsonian Institution Libraries (SIL) forms a vital part of the research, exhibition, and educational enterprise of the Institution. The Smithsonian Institution Libraries unites 20 libraries into one system supported by an online catalog (www.siris.si.edu) of the combined collections. The Libraries serves the Smithsonian and the public with information and reference support. Its collections number over 1.5 million volumes including 40,000 rare books and 2,000 manuscripts. The Libraries also holds the nation's largest trade literature collection, which includes over 300,000 commercial catalogs dating from the early nineteenth century and representing more than 30,000 companies.